After many years in this business, I have come to the realization that there are two main forces that drive the social media message. 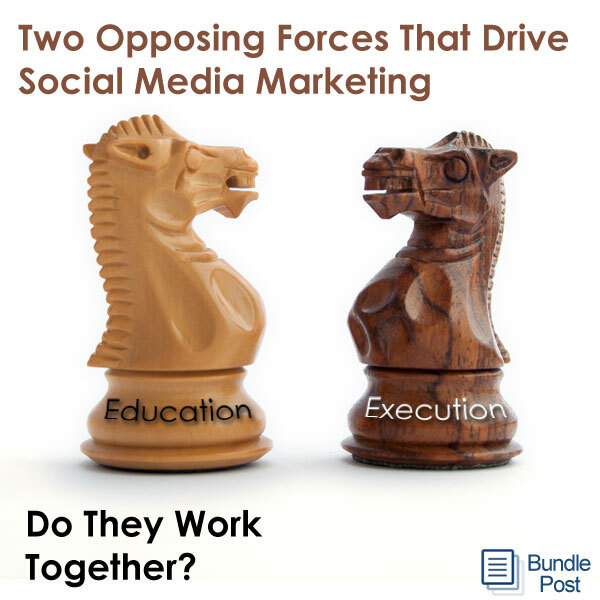 These two connected, but sometimes opposing forces combine to keep social media marketing at the forefront of on and offline marketing discussions. These two forces are what enable the numerous events, trade shows and conventions that the social media space seems to do at much higher levels than most other industries. I will attempt to outline these two forces with as little bias as possible, while providing some editorial perspective to each. Description: The education forces are made up of Bloggers, Consultants, Strategists, Speakers and Trainers whose business is that of coaching and teaching others on how to do social media marketing. Their income, fame and expertise is often solely or largely derived from teaching or consulting other individuals or brands about the space. Advantages: Since social media is constantly changing, the educational aspect of social media marketing is crucial. Daily changes to platforms, methods and tools require effective marketers to stay current on what’s new and more importantly what’s changing. The educational forces within the industry ensure that these changes are disseminated to active social media participants. Educational forces are also extremely helpful to those that are new to social media marketing. Let’s face it, understanding the many do’s and don’ts of social media, let alone the most effective “how to’s” is not something easily figured out on your own. Educators within social media provide basic level know how to newbies and those wanting to migrate from dabbling in it. Another positive that results from industry educational forces is the top of mind effect that occurs both on an offline. What I mean by that is with so many events, speakers, books and blog posts that educate on social media marketing, it constantly drives the press and other media sources to keep it in the news. We see this in the form of brands and news outlets constantly promoting their social profiles and making social media part of their stories and advertisements. Educational forces help ensure this continues. Description: Executional forces are Internal Brand Departments, Individual Marketers, Social Media Agencies whose business is that of actually executing social media marketing. Their income and ROI is largely derived from effectively implementing social media marketing on a daily basis that achieves sales, revenue, lead generation or other result oriented outcome. They don’t derive income from promoting social media in general, generate blog traffic about their social media trainings or how to/strategy consulting services. They are brands and marketers that promote and sell using social media, not promote and sell social media itself. Advantages: Without executional forces, there would be no need for the educational forces of the industry. Those that are actually executing social media marketing well and therefore achieving real measurable results provide the credibility to an otherwise hypothetically effective marketplace. Executional forces also provide the data used in research reports that fuel social media marketing’s prominence. It’s the wood in the fire that drives the press coverage about the industry on a continual basis. Lastly, the executional forces enable integrated marketing by connecting all aspects of on and offline marketing components together by “doing the work”. Can These Two Opposing Forces Work Together? The answer is yes, they can work together, but they must improve how they work together. As the social media market, platforms and tools begin to consolidate through mergers and acquisitions, educational and executional forces need to combine their forces or realize the consequences. The industry needs to better manage the educational forces that are controlling the messaging of the industry and executional forces are all too quiet about how they are getting real results. Should industry educators be held accountable to provide social proof of what they teach, beyond their celebrity status? Should they be somehow required to show executional experience that supports their desire to be a social media consultant or educator? Should executional forces do a better job of crossing the divide with educational forces? Yes, yes and yes to the final 3 questions. You bring up some excellent points. I am much more involved (practically 24/7) in the execution side of the industry, managing my own brand and several other very satisfied brand/clients who “outsource” their social business voice to my firm. And, I also love to learn and teach along the way, so I devote a portion of each week to continuing my education as the industry changes daily. And, I also coach/teach about Social Business, with a special emphasis on local SMB communities, who find themselves so far behind, and frustrated, knowing they need to join this marathon ASAP. It’s imperative that we all continue this conversation, asking these questions. Thank you for your wise insights. I hope it encourages many in our industry to delve deeper and do extraordinary work, for the benefit of all Social Business. That is indeed the goal of the post. Open some eyes to the two forces and get both sides out of their camps and working together to further the success stories of the industry beyond the big brand “campaigns” that cannot be replicated by an SMB. I see new, innovative and big things to come! Thanx for jumping in Lynn. Great post Robert. If this were a Venn diagram, like Lynn, I prefer to work in the sweet spot; actively coaching/mentoring and managing social for clients. I believe it’s essential that we educate our client’s about the process, strategies and measurements. The most effective outcomes are when they balance what they can do in-house with their external agency (consultant) and build an overall effective program focused on the company’s short and long term business goals. Such an important point. I teach agencies that it is a requirement for their clients to have some parts in the process. For example; you can’t be there in their office every day, so they have to be taking pictures and getting them to you for posting. Every client must have a part when working with an agency. Very thought-provoking. I think one of the issues is that the educational forces rely on executional forces. Educational forces don’t have the same leverage and, therefore, aren’t seen as important to executional forces. The collaboration of the two could bring a golden age of social media marketing.